Coming back from the summer holidays, the Florentines and all the ihnabitants of the Chianti area soothe themselves with the coming of “Canaiolo” grapes, a particular kind of grapes from central Italy, and with a special cake prepared using it – the typical “schiacciata con l”uva”. 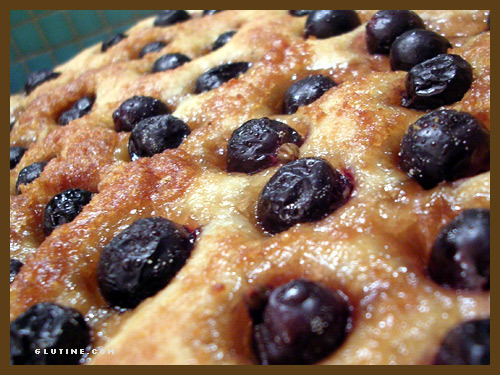 It’s a very simple dessert, done with the same mixture as bread with a little oil and so and sooo much of grapes. Every bakery has its special and unique recipe, some use anise, some add more sugar, some less. The recipe we report here it’s not too sweet, it’s enriched with a glance of anise, and in the end it’s not too thick. By the way, a real “schiacciata con l’uva” must dirty your hands with the grapes sticky purple and must leave all the little seeds in your mouth (never use seedles grapes)!!!! Let the brewer’s yeast melt in a bowl with some tepid water. Add some flour, and start to mix with one hand. Add some salt and some sugar. Then put the mixture on a pastry board and work it until it appears to be firm (if necessary, add some flour in the beginning of the process). Add a spoonful of oil and keep working it for at least 20 minutes. Grease a bowl and put the mixture inside, covering with foil (without sealing it). Wait until it gows double its size. In the meantime, wash the grapes and dry it. When the mixture is grown, put it in a pastry board (which has to be covered previously with some flour). Grease a backing tin with oil and let half of the mixture cover it (the other half must remain outside the tin). Now, put on it two-thirds of the grapes and 2-3 spoonfuls of sugar, a little anise and a spoonful of olive oil. Fold it with the other part of the mixture, push it on the whole surface and add the rest of the grapes. Another time, add sugar, anise and olive oil. Push it again and cook in a pre-heat oven at 180°C for 45-60 minutes. Learn the secrets of the Florentine cuisine with the Institute Galilei’s cooking courses!